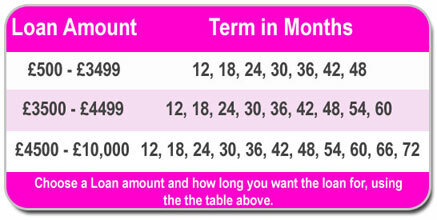 Its easy to get your guarantor loan today, use the table below to select your loan amount and how long you want your loan for, then fill in the 60 second application form to the right. It is important you use the loan amounts and loan term from the table, as different loan amounts are only available over certain periods. Can you please make sure that all fields on the application are filled in (apart from the optional address field) your application can not be processed without this information! If you Only have a Mobile then you can put your mobile phone number in twice as your "home Phone" and "mobile Phone". But the less options you give us to contact you to discuss your application the harder it will be for us to reach you. to process my loan application. We need this information to be able to contact you about your loan application.